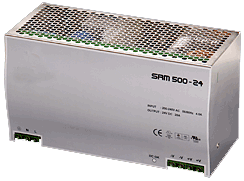 Switch-mode rectifiers of the type Wärtsilä JOVYREC500 are primary switched power supplies with performance ranges of 40 A/24 V up to 21 A/48 V. All power supply modules of these type series are convection-cooled. The rectifiers dispose of single-phase inputs, for modules of 30 to 40 A three-phase inputs are necessary. The rectifiers of the type Wärtsilä JOVYREC SRM500 are suitable for panel as well as for top-hat rail mounting. Up to 200 A can be achieved via parallel connection of up to five modules.